The sun has been worshiped by both ancient and modern peoples throughout the ages. Those of ancient cultures honored the sun with sacrifices and those of the modern age have devoted hours upon hours to sunbathing, gaining a bronzy glow and a healthy dose of vitamin D. In recent history, the sun’s power has been harnessed to provide an environmentally conscious energy source. No matter if you are a fair-skinned person who must lather on a thick layer of sunscreen or someone who employs the benefits of solar power, no one can deny the sun’s power. The sun is one of the the most essential resources for life on this planet and we are forever indebted to this powerful star. However, with great power comes the need for relief. Often, because nearly everyone has experienced the searing pain of a sunburn or the discomfort of a forgotten pair of sunglasses, when we consider sun damage, we immediately think of the damage that UV rays cause and all those products dedicated to not only sunburn relief, but also reversing premature aging caused by sun damage. However, the sun doesn’t just inflict pain and damage on our bodies, but it can also damage our homes and put a substantial dent in our pocketbooks. 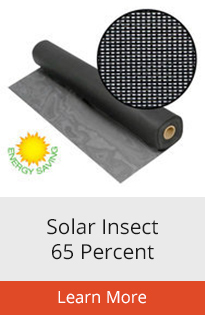 Solar screen is wonderful PVC-coated screen product created to give relief and protection from the sun’s harmful UV rays and insects, while still allowing some natural light to enter your home, patio area, business, or building. Solar screen comes in a variety of formats, colors, and protection levels to fit your needs. 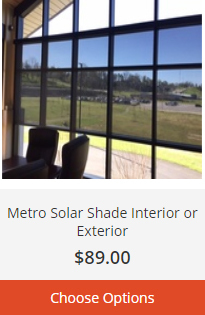 Because we at Metro Screenworks believe in offering our clients custom screen systems and solutions, we offer solar shades for windows, exterior solar screens, and solar screen rolls. 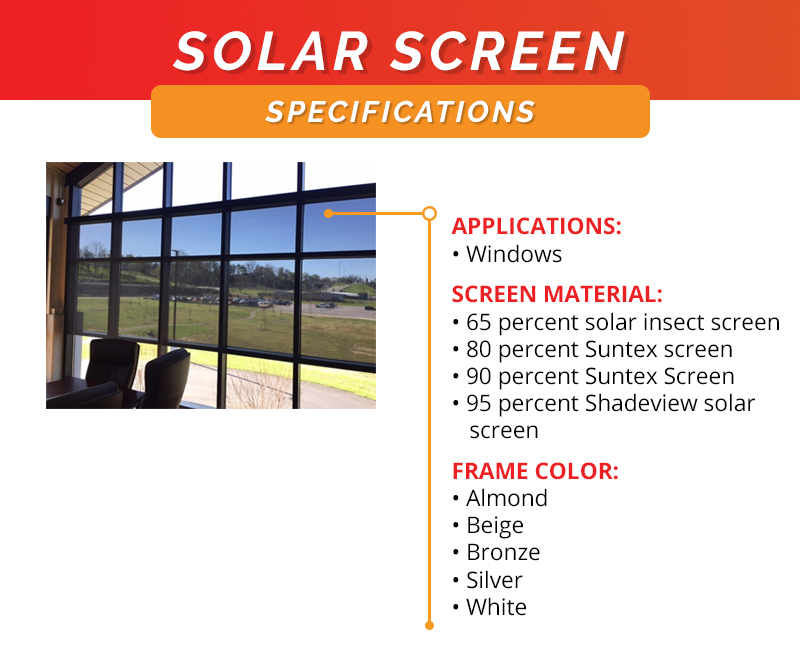 To learn more about the general benefits of solar screen, keep reading or check out our individual solar screen products below. Solar screen, no matter what format you install in your home, business, or building will provide general protection and benefits. Though it may seem like an initial investment, the benefits that solar screen provides will pay you back sooner than later. Solar screen shades protect the interior of your home. Though the sun is a source of life, constant exposure to the sun can significantly damage your furniture, flooring, and decor. According to an article published by Geico, the sun is responsible for nearly 40 percent of our interiors fading. Light isn’t the only thing entering our homes. UV rays and infrared energy make up half of what is entering our homes. Repeated exposure to UV rays and infrared energy causes the materials that make up the items of our homes to become unstable and prematurally age. Protect that antique bureau, pictures of your family, your favorite expensive couch and more when you install solar screens. We have all been there—unless you have a windowless entertainment room—when you are trying to watch TV and the sun’s glare is making seeing what is on the screen difficult if not impossible to see. If you have a moment to watch TV it is probably a well-deserved rest to enjoy your favorite movie or TV show after a long week, or maybe it’s time that you have set aside to spend with your family. Regardless, of your reason for taking time for entertainment, you shouldn’t have to contend with the sun. Also, direct sunlight can damage your fancy big screen LCD TV; consistent direct sunlight will cause the chemicals that create the images on your screen to deteriorate and prematurally need repair or replacement. Thirdly, solar screens are a relatively affordable way to reduce the amount of money that you spend on your energy bills, assist your HVAC system in keeping the temperature in your home or business uniform, and providing even greater comfort. If you are looking to make your home more energy efficient, installing solar screen is an affordable start that can make a significant impact even before you invest in energy efficient appliances. Though the actual dollar amount that you will save a month is dependent on your particular home, the sun exposure on your property, and other factors, the financial implications of solar screens can not be denied. Lastly, installing solar screens can protect your family and clients and generally add to their quality of life. Not only will those in your home or business not be exposed to as much harmful UV rays and infrared heat, they will not have to contend with sun glare that can damage eyes and significantly decrease your vision. Though the dog or cat might not have a sun spot to lay in that is quite as enjoyable as the one that occured before the installation of solar screens or solar screens for your windows, your family, clients, and patrons will thank you for the overall comfort and protection that a simple roll up solar shade or other solar screen product provides. If you have read about the benefits of solar screens, you will probably already have a good idea as to how solar screens can significantly improve your life. They can not only protect your home’s interior from fading and premature deterioration and increase the overall comfort of your home, but they can also allow you to save significant money on your energy bills. If you are ready to invest in solar screens, here is how they can work for you. One way to implement solar screens in your home and begin to enjoy the benefits of this innovative product is to install solar screens for windows. Solar shades are window screens that can be substituted for your standard screens. When you install these solar screens, you do not have as much control over how much sunlight and UV rays enter your space and it can cause your home or business to look like it is wearing sunglasses. However, you do not have to worry about rolling up or unrolling your shades; you have consistent protection during all times of day. Roll up solar screens, on the other hand, do provide options. 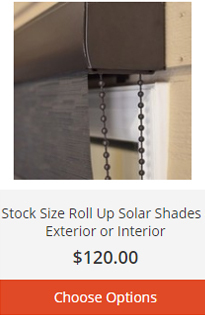 These easy to install screen shades are controlled by a pull chain that allows you to set your solar shade to any length that you want, whenever you want. 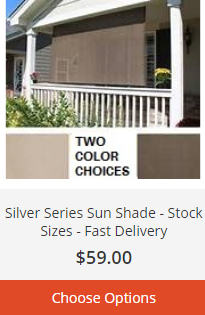 Also, the roll up solar screens that Metro Screenworks offers come in a variety of colors allowing you to have a sun shade that not only practically serves you by protecting your home and family from the discomfort of the sun, but also compliments your overall aesthetic. Our roll up solar screens can be installed inside to shade your interiors or outside on your patio to shade your family as you enjoy time around the dinner table or playing in your pool. Our solar shades are made with high-quality and durable materials to weather abuse inside and outside your home. Live somewhere where you may need to bring in your screens during the winter season? No problem. Our roll up solar screen can be easily unhooked from their mounts and stored inside. Solar screen rolls provide you a variety of options allowing you to have the sun protection that you need for you home. 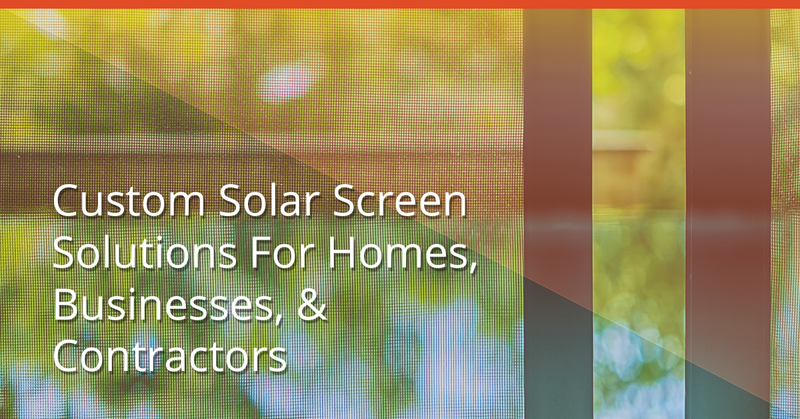 Instead of investing in premade screening products, you can buy a solar screen roll. With our bulk screen rolls you can install solar screen in your window screen frames that you already have, your screen door, and your screened in porch panels as well. By offering a variety of lengths and widths as well as protection levels, we are able to meet your needs for your next home improvement project. Solar screens provide three benefits for your business: money-saved due to energy efficiency, protection for you interior and exterior assets, and comfort for your employees and clients. Basically, when you install solar shades in your business, you will be making a positive and substantial impact on your bottom line and the success of your business. For not only will less sun exposure protect your assets, less of your budget will have to be directed towards operating costs, and the comfort level these provide may cause employee satisfaction to increase and your customers to more likely to frequent your business. Depending on your business, installing solar screens for windows may be the perfect addition. Because these solar screens are installed right in the window screen frames themselves, you are able to have peace of mind knowing that no matter what time of day or who is on the clock, your business is protected from the ravages of the sun. Our solar screen is available in various strengths to fit your needs and can be made in custom sizes to fit your windows. If you do not wish to buy completely new window screen frames, but simply want to install solar screen in your pre-existing frames, solar screen rolls may be your best option. Metro Screenworks offers our solar screen in various widths and lengths to equip you with what you need. We also provide all the tools and parts needed to properly install your screens. Roll up solar screens can be great additions to your business as well; they allow you to customize your sun protection based on your comfort level and the needs of your staff, patrons, customers, patients, and employees. Our roll up solar screens come in a variety of sizes, colors, and are easy to install and operate. Solar shades can be a crucial element for not only protecting the investment that is the interior elements of your restaurant, such as TVs, equipment, and furniture, but also protecting your business. We have all been patrons of businesses that have not quite caught on to the benefits of window solar screens and have had to deal with searing sun glare or the uncomfortable effects of being overheated. Though we of course offer solar window screens and solar screen rolls, one of our most popular products for restaurant owners is our roll up solar screens. These are easy to install inside or outside and can be easily unhooked from their secure mounts to store away during windy winter storms. Roll up solar shades provide excellent sun protection—up to 88 percent—and can be applied to exterior and interior applications. Our solar screen shades are easy to install and sit securely in place on your wall or ceiling. However, you can remove your solar screens easily and clip them back in place once you want to use them again. Metro Screenworks solar screen shades are not only practical, but offer an attractive aesthetic. Our oil-rub bronze valance which can withstand indoor and outdoor elements compliments the colors of shades we currently offer which includes Maui, Tropic, Caribbean, and Kona. Our shades are easily operated by a pull chain which matches the valance finish, but can be operated using a crank or a remote-operated motor. Our exterior solar shades come with tie downs to keep them in place when you install them on your deck, porch, or patio. Install our roll up solar shades in your home, business, or restaurant. We also offer custom sizes as well. Our solar shades for windows can provide sun protection for your home, business, and other structures. We offer our solar shades in varying sun protection strengths, window screen frame colors, and sizes. Our solar shades are perfect for those applications that require constant protection from the sun and can eliminate hot and cold spots in your home, business, and restaurant, and can make your home or building more energy-efficient. Get sun and insect protection with durable and attractive solar screens that fit your needs and your aesthetic. Shop our complete inventory online, request a sample, or speak to one of our representatives. 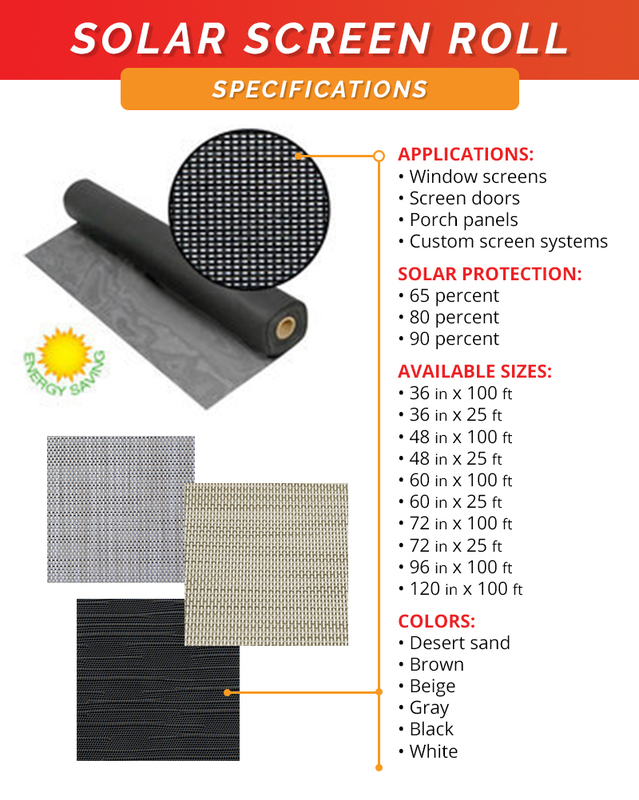 Our solar screen rolls are perfect for those who need custom screen options, are constructing porch panels, want to rescreen existing screen frames, and those needing large quantities of screen. All of the screen rolls that Metro Screenworks offers are made with the same high-quality solar screen as the rest of our products. 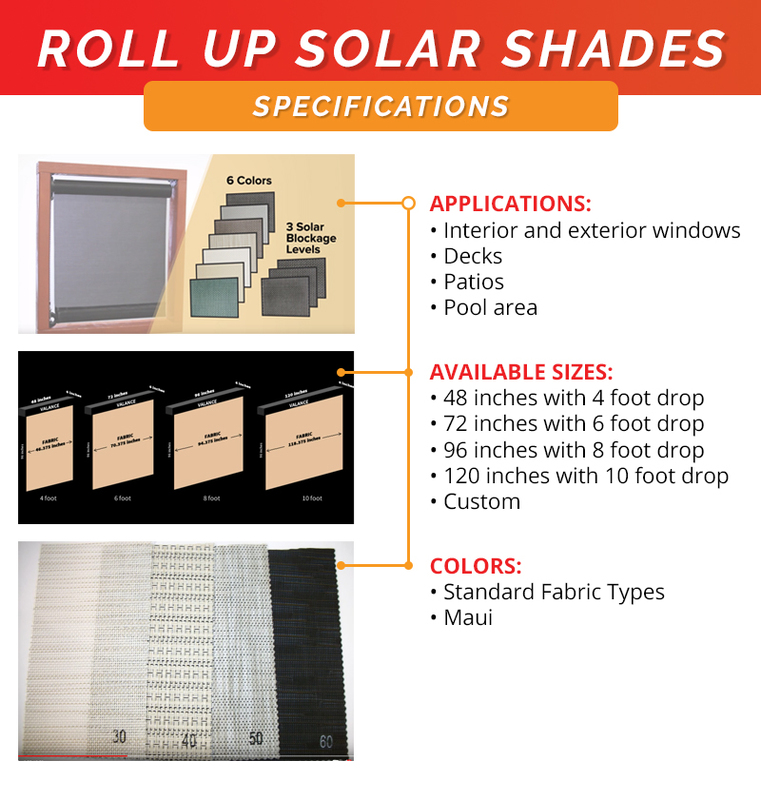 To accommodate a variety of needs, we offer our solar screen rolls in a variety of roll sizes, colors, and solar strengths. When you install our solar screen you can benefit from 65 percent and up to 90 percent sun protection. Not only does our screen offer these benefits, but you also receive protection from insect pests. Shop Metro Screenworks online, request a sample, or speak to one of our representatives. Ready to make your own customized window screens? Watch our video detailing how to make your own window screen. Visit our FAQ page! Need to replace your window screens or is it time for an upgrade? Watch our video to learn how to measure for your new window screens. Have more questions? Visit our FAQ or Measuring FAQ page! Having a customized screen door can not only look better—matching your homes or business’ look—but it can also provide more benefits that your standard screen door. Watch our video to learn how to assemble your own. Have more questions? Visit our FAQ or Measuring FAQ page! A screened-in porch can be a great way to enjoy the outdoors, while staying protected from insect pests and the heat of the sun. Watch our video to learn more about installing porch panels. Have more questions? Visit our FAQ page! Metro Screenworks is the online screen store that you can rely on for high-quality, durable, and innovative custom screen products, tools, and parts. We supply homeowners, business owners, contractors, and more with custom screen products that can’t be found at your home improvement store or supplier. Learn more about Metro Screenworks on our website and shop our entire inventory online. Want a sample to see the quality of our products for yourself? We can do that too. On Metro Screenworks’ blog we aim to inform with useful information for the installation, benefits, and use of our screen products, but also educate our current and new customers about screen tips, new products, and more. Additionally, we even entertain our blog readers with topics about the history of screens and other interesting facts. Read our blog to learn more about solar screens and our other screen products and paroos recent blog posts below.